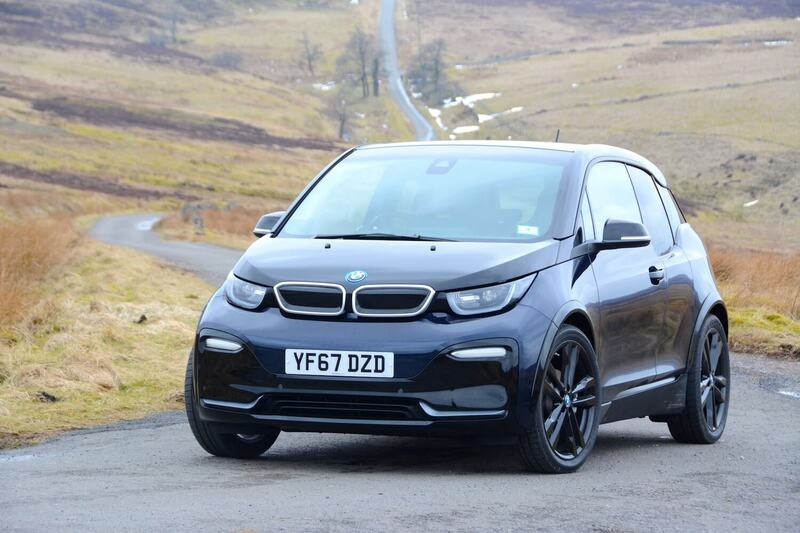 The BMW i3 was extremely innovative when it was launched back in 2013, and it remains so today, five years on. Along with a series of mostly minor updates to the i3, the i3s has been introduced, which promises a sportier driving experience. So should you consider the i3s over the i3? Over the five years since it was introduced we’ve come across people who love the way the BMW i3 looks, and people who don’t love the way it looks. One thing you can’t deny is that the styling of the BMW i3 is unique. This applies to the interior as much as the exterior, which features fresh design as well as interesting materials, many of which have a natural/recycled appearance. And the dashboard even manages to combine form with function. 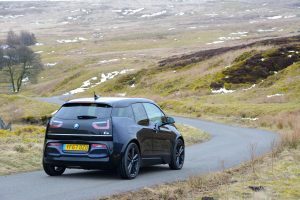 Although the i3 has a relatively small footprint on the road (4 metres in length is the size of a supermini – it’s marginally shorter than a Fiesta), the interior is very spacious (larger than a BMW 3 Series) as well as featuring innovative design. 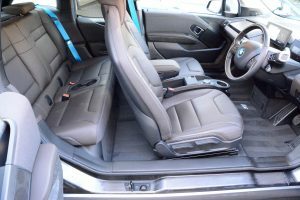 However the i3 only has two rear seats, and to extract people from these seats, the front seat occupants have to open the front door in order to open the rear door. Once you’ve done that you’re left with a large opening, with no central door pillar, however this is not as practical for the average family with children as other more conventional electric vehicles. 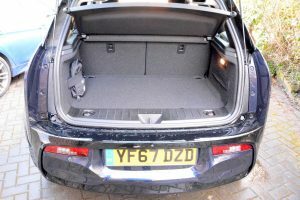 The 260-litre boot can also only be described as being of average size, however there’s also a small compartment under the bonnet which can be used to store the charging cables. 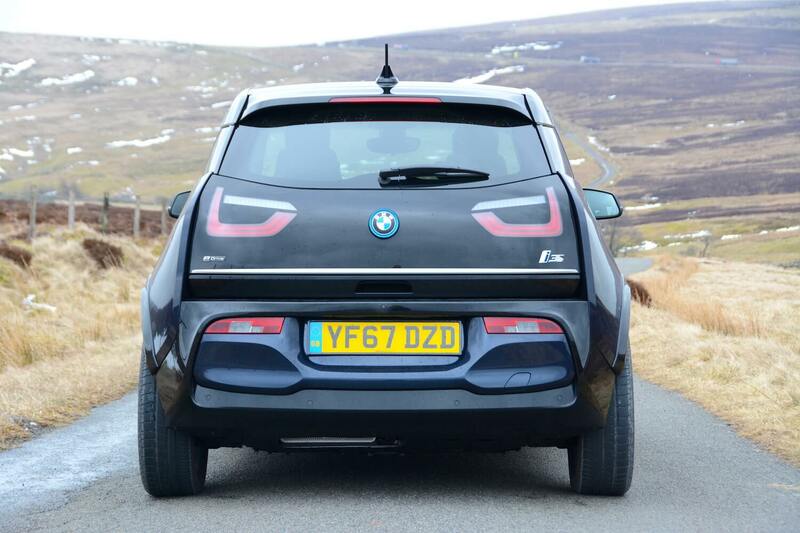 Compared to the standard i3, the i3s has 40mm wider track, 10mm drop in ride height, and 20mm wider wheels (20 inch). 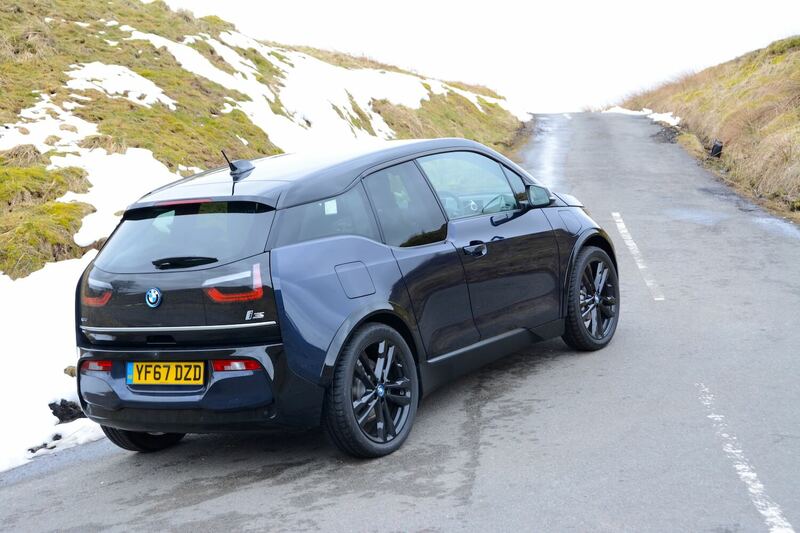 Power is up, to 184hp (the i3 has 170hp), as is torque, at 270Nm (i3 is 250Nm). In addition to peak power improvement there’s 40% more power and torque at high rpm. The i3s retains the single-speed transmission. 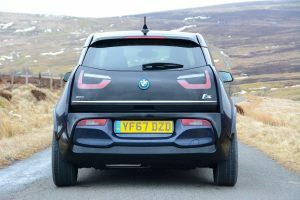 Under the skin, the i3 has a large lithium-ion battery in its floor, and the body structure is largely comprised of carbon-fibre reinforced plastic (CFRP). 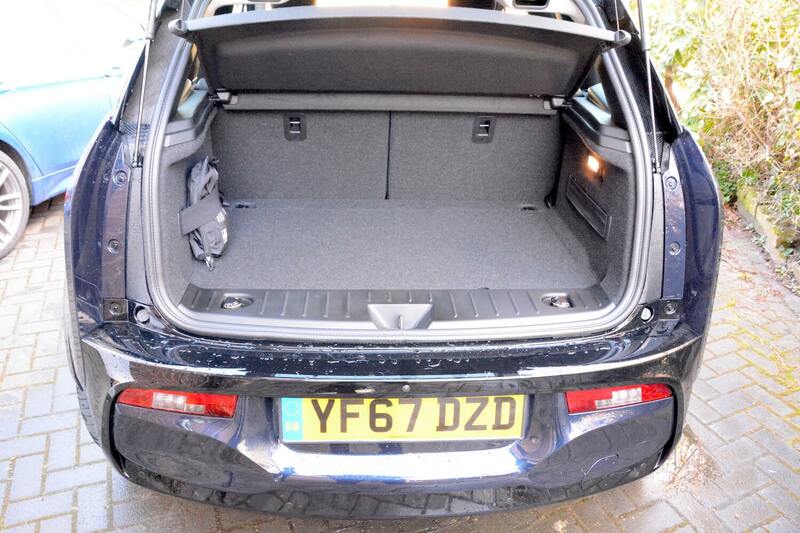 In the case of the range extender, as tested, there’s a 2-cylinder, 0.6-litre petrol engine related to that in a BMW motorbike under the boot floor. 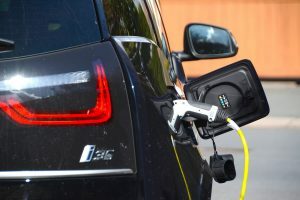 If the battery charge is depleted, the range extender can provide charge to the battery until it can be recharged, or until the 9-litre fuel tank can be topped up. 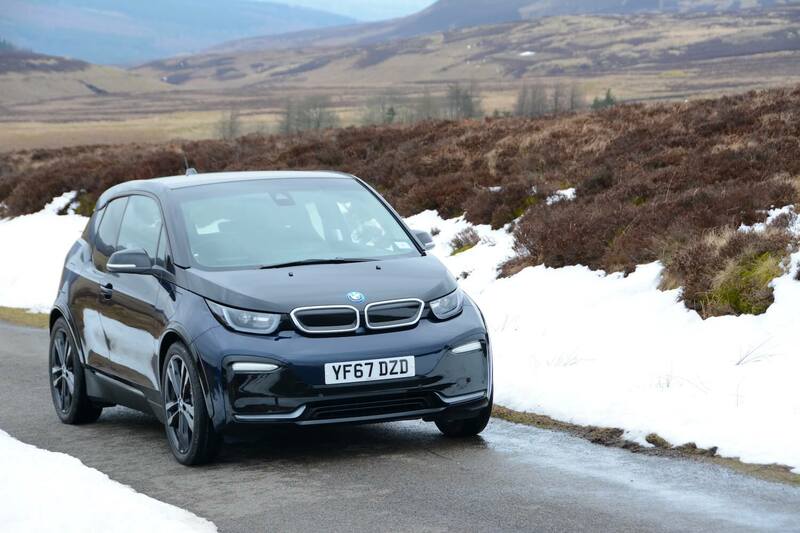 So unlike a plug-in hybrid, which switches to its petrol or diesel engine when the battery is empty, the i3 is always propelled by the battery and electric motor. 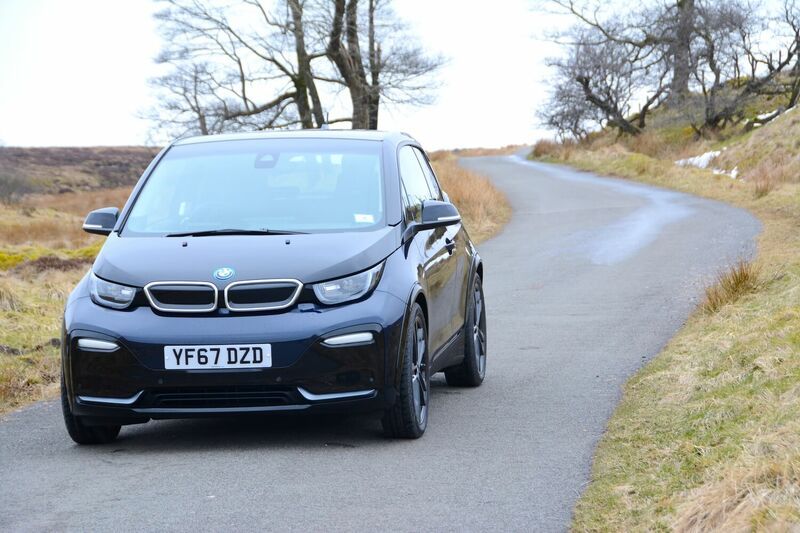 Green Car Guide was on the UK launch of the BMW i3 in November 2013. The launch was in London, and involved a drive to Brands Hatch, where you chased a BMW M3 around a cold, damp circuit in the i3. 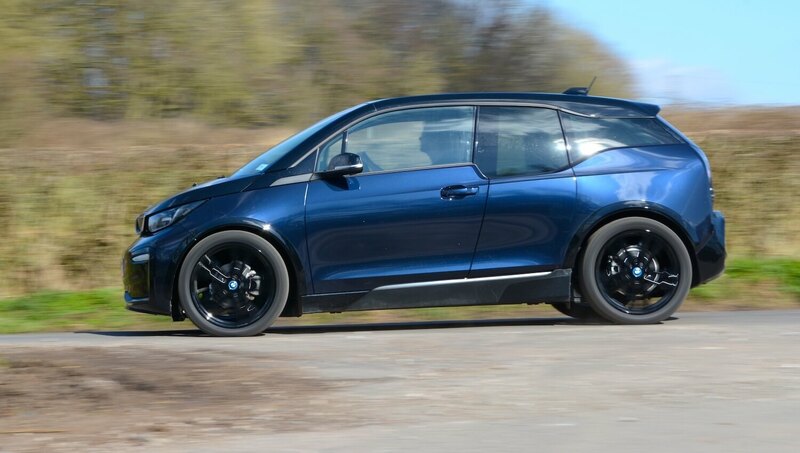 That initial drive provided enough evidence that the i3 had the potential to be a fun driver’s car. Since then we’ve driven the i3 many times, but mostly on typical urban and suburban roads. 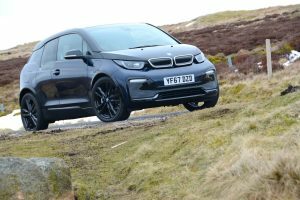 During the week with the BMW i3s journeys included trips from Cheshire to Sheffield, Preston, Liverpool, Manchester and Yorkshire (twice). Routes such as the road up to the Cat and Fiddle near Buxton confirmed that the i3s is indeed the driver’s car in this sector of the EV market: the electric powertrain, with its instantly available maximum torque, provided smooth, effortless progress up long hills (there’s none of the mechanical straining that you would get in a petrol or diesel car), and the rear-wheel drive chassis means that the BMW i3s continues to provide a rewarding driving experience long after the novelty of a front-wheel drive EV would wear off. Because of the weight of EV batteries, it’s not possible – at this point in time anyway – to buy a lightweight, agile EV, but at 1440kg for the range extender model (1320kg for the pure electric model) the i3s, thanks to its carbon-fibre reinforced plastic (CFRP) structure, is about as close as you can get. 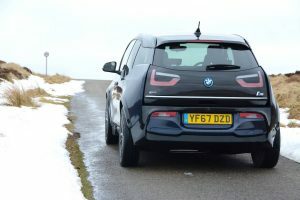 The i3s has wider tyres than the standard i3 and this definitely provides more confidence through corners – the standard i3 feels as though there’s not much grip from the front tyres when cornering in the wet. The car’s ride is generally good, however the secondary ride is poor – it doesn’t like hitting bumps, and the car occasionally exhibits a ‘see-saw’-like pitching on some undulating road surfaces. However the seats and driving position are comfortable – we’d be very disappointed if this wasn’t the case with a BMW. The i3s has a new traction control system; BMW claims it reacts 50 times faster than previous systems (unlike conventional driving stability systems, the control process is now calculated directly in the powertrain instead of in a remote unit requiring ‘long signal paths’), and it does feel excellent. You can feel the rear-wheel drive chassis helping to push the car through corners, and hooray! – unlike cars from many other manufacturers, there’s no discernible point at which the tyres lose grip and the traction control kicks in abruptly. For keen drivers, this is actually a revelation. 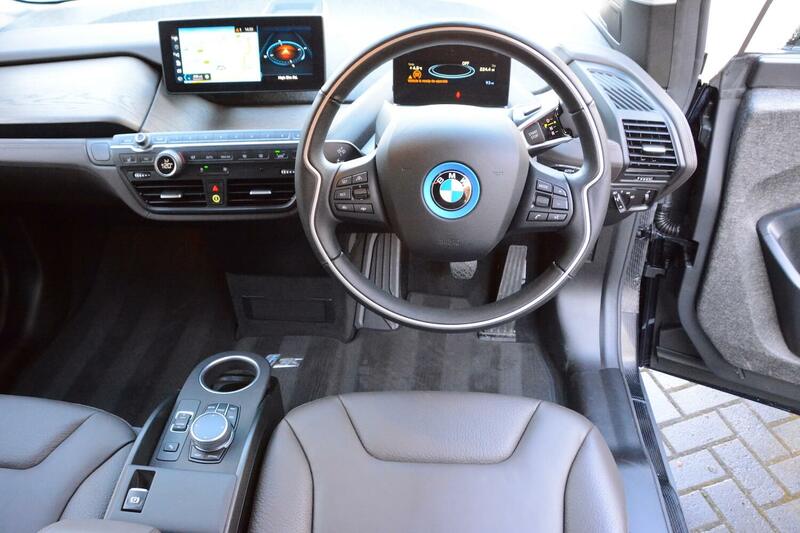 The i3s has four driving modes: Sport, Comfort, ECO Pro, and ECO Pro +. As you would expect, Sport is the most responsive; Comfort is for daily use; if you want to eke out the driving range, then ECO Pro is the one to go for; and if you’re getting really desperate in terms of range, then select ECO Pro +. Eco Pro limits the car to 70mph, but if you floor the accelerator, it will override this. The i3s accelerates from 0-62mph in 6.9 seconds, compared to 7.3 seconds for the i3. It feels quicker than the stats suggest because of its instant torque, and it still pulls hard at motorway speed, suggesting that the 40% increase in power and torque at high rpm is true. It feels at home at speed, and is excellent for getting into gaps in motorway traffic between 50 and 70mph. 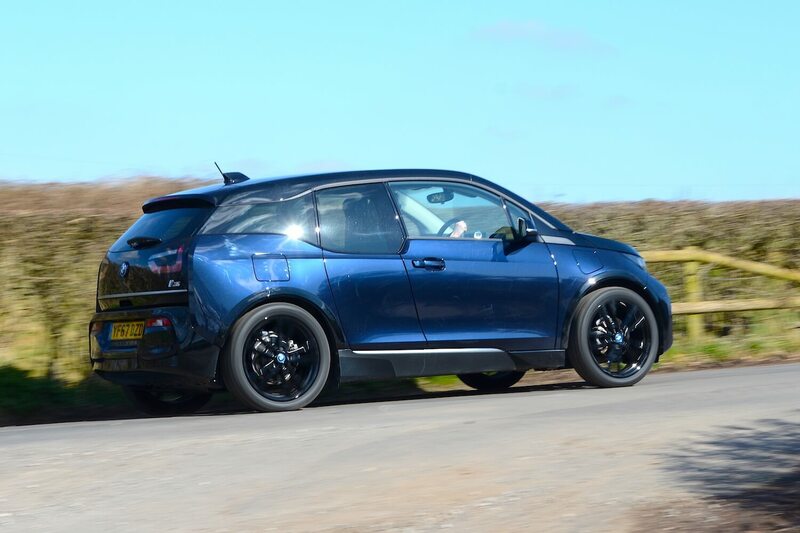 When you drive a BMW i3s for the first time you’ll be very aware of the high level of brake energy regeneration, which results in the car slowing down sharply when you lift off the accelerator. Whether you like this or not is a personal preference, but we’d like to see the option of being able to adjust this rate of regen to make it less intense if desired. The i3s will automatically start in pure electric mode, and won’t allow you to select the range extender until the battery drops below 75% charge. This isn’t always ideal, as the first part of your journey might be on the motorway, with the remainder in urban areas; in this scenario, using the range extender would be best for the initial stage. Selecting the range extender involves a lot of button pressing on different screens, as does selecting the battery again. It would be much better to have a button on the dashboard to do this. Thankfully you can programme a shortcut button to do this. When the range extender is operating, there’s not much on the instrument panel to tell you, apart from a very small white arrow which moves from the left of the battery bar to the level of battery charge that you want to maintain, and the the fuel gauge and ICE range estimate on the left hand side of the screen has a subtle change from grey to white. Electric vehicles are obviously quiet and refined in terms of their powertrains, but because of this, other noises can intrude into the cabin. With the i3s you certainly experience tyre noise on certain road surfaces. And if you do have to use the range extender, then there is a distant hum present. We regard BMW’s iDrive infomedia system as the best in the business, in large part due to the rotary dial and shortcut buttons meaning that you don’t have to try and touch small buttons on the screen when driving, and this latest version has been further tweaked to offer yet more of an improved experience. Details such as the ability to zoom in or out of a map manually or automatically are particularly useful. It’s also worth noting that the LED headlights (now standard on all i3 models) are excellent both on dipped and full beam, with very white light, great spread and range. The i3s does not have a conventional gear selector; instead you twist a control on the right-hand side of the steering column. In all other automatic BMWs that we’ve driven, you pull the gear lever towards you for Drive, and push it away for Reverse. 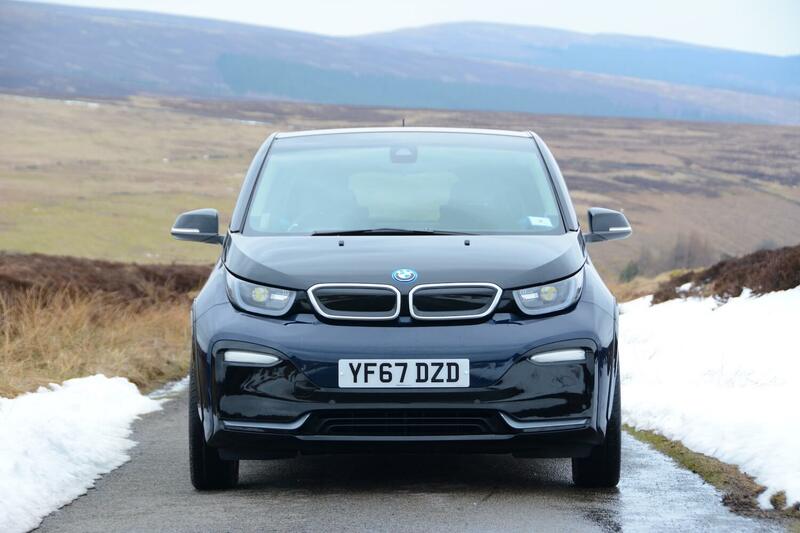 With the i3, you do the opposite, which can be confusing for drivers of other automatic BMWs. The all-electric i3 – or i3s – emits zero g/km CO2. The range extender can’t quite match this, but comes close, at 14 g/km CO2 (based on the NEDC test). It also has an official fuel economy figure of an amazing 470mpg (which, in real-life, obviously completely depends on how much you drive on electric power). It’s also interesting to see that on the data sheet BMW has quoted NOx emissions for the i3s of 0.0007 g/km (yes this is very low!). Data on NOx emissions from manufacturers is usually virtually impossible to find. 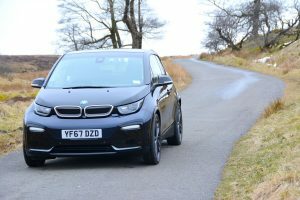 BMW estimates that the i3s has a range of 112 miles in EV mode and 93 miles on the range extender, giving a total of 205 miles (based on urban running at 20 degrees in Comfort). The new WLTP test has the EV range as 115 – 121 miles. Our own testing showed that the real-world range matches BMW’s estimates. A fast motorway run in Sport with no attempt to drive efficiently revealed a minimum range of about 90 miles. Maximum range when driven at 56mph and eco driving everywhere in ECO Pro and ECO Pro + was 140 miles. Driven normally in Comfort, 120 miles is easily achievable. The petrol range from the 9-litre tank was between 70 – 100 miles (this shows that you shouldn’t drive using the petrol range extender for long periods if you can avoid it, as the i3s will only return around 35-50 mpg when doing this). So a combined range of between 160 – 240 miles is realistic. Despite covering over 600 miles during our week with the i3s, the vast majority was driven on battery power; only around 60 miles (ie. 10%) was on the range extender. Charging times depend on how you’re charging, but with domestic charging – where a wall box is the recommended solution – you’ll generally need to plan to leave it plugged in for much of the night to get a full charge. You can charge very quickly at many public chargers, particularly at motorway service stations. 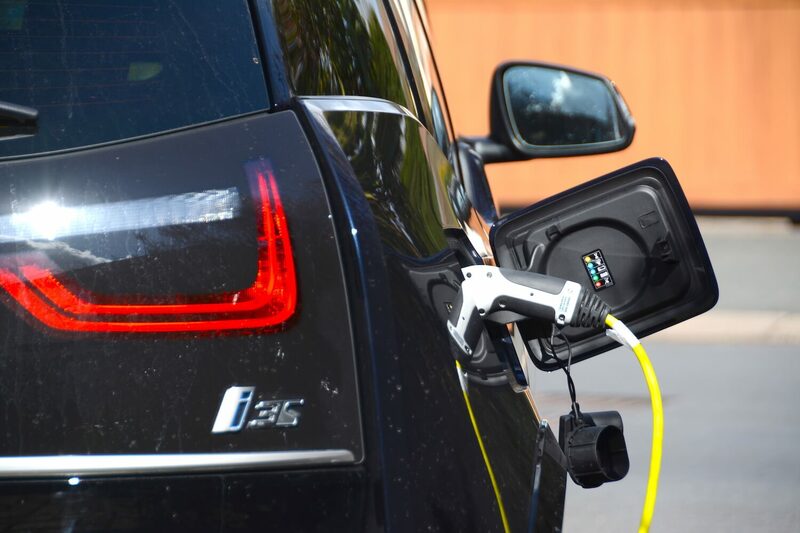 One excellent charge point provider that may be a new name to many people is Instacharge. A 50kW chargepoint maintained a full 48kW charge up to 90% rather than 80%, only taking about 30 minutes to get the i3s to 90% from 6.5%. 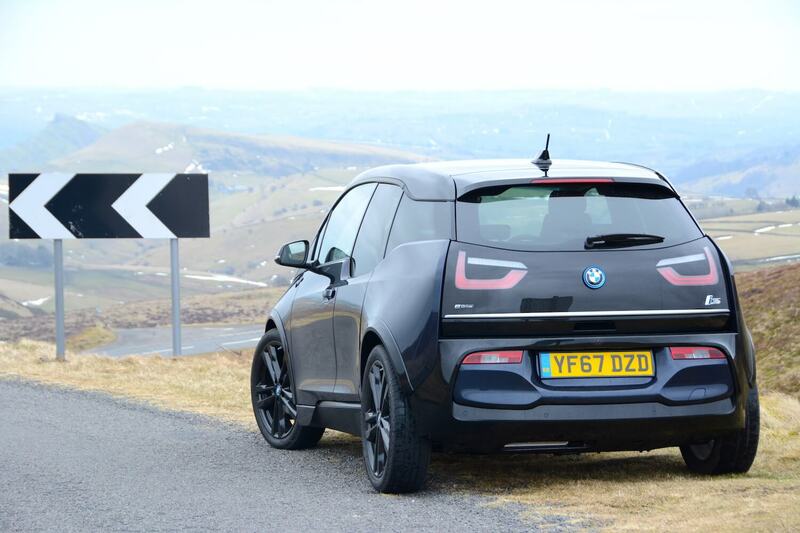 The BMW i3s has its faults. With only four seats and the suicide rear doors, it’s not that practical. Despite the range extender technology in our test car, the total real-world driving range before a recharge or a refuel of only around 200 miles isn’t great when compared to a typical petrol or diesel car – or to some of the latest EVs. And at £35,630, or more when you add options, it’s more expensive than its competitors. 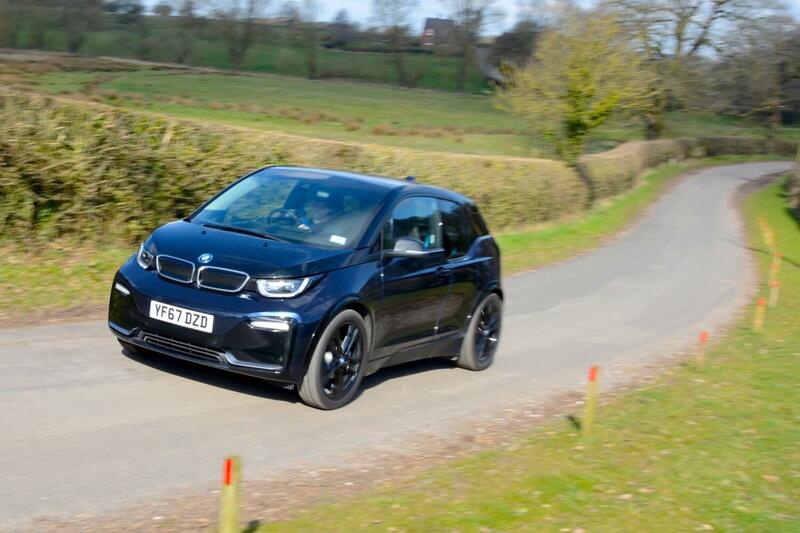 However if you’re looking for an EV in this class that will also offer a rewarding driving experience for the duration of ownership, then the BMW i3s doesn’t really have any competition at this time – and that’s why BMW believes it can charge a premium for the i3s. And the BMW i3 – or i3s – is the only range extender option on sale in the UK at the moment, so again it has a unique place in the market. BMW sells more i3 range extenders than pure electric models, proving that motorists feel more reassured by this technology. For 12 years Green Car Guide has been searching for cars that are efficient and great to drive. 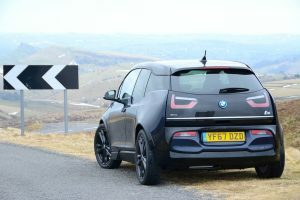 The BMW i3s has a big tick in both of these boxes, as well as being desirable and interesting, and so, despite its faults, it’s awarded a Green Car Guide rating of 10 out of 10.